First things first...thank you all for your kind words about the pie and finding a way to overcome fears. You have no idea how much it means to me to have your support. I am really working on allowing myself to be "me" this year. I guess, I am finally old enough to be allowed to do that. So, thank you all so much! Yesterday flew by for me. The illustrator walked downstairs at 8:20am and was blown away by the mess I had already created in the kitchen. By this time, I had already worked out, made pancakes for one boy, made an over easy egg with toast for the other boy and put a recipe together in the crockpot for a client. Yeah, it looked like a cartoon mess in the kitchen. 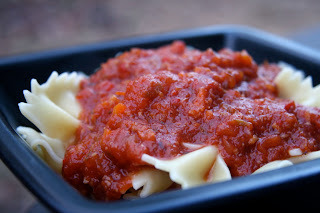 No worries, I tackled the mess and created a great recipe for my client! Since everything was crazy around here yesterday, I kept other things a little more simple. The boys wanted a treat after dinner so I threw together a little peanut butter and honey cereal bar. 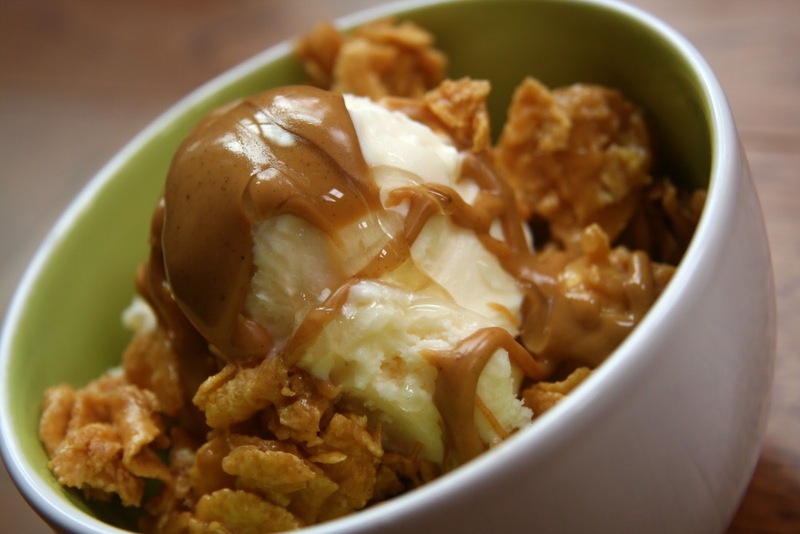 The recipe was quick easy and who doesn't love the peanut butter honey combination? Well, except vegans, but I am sure you can use agave here too. The boys have been on an ice cream kick lately. I have no idea how anyone could eat anything that cold while it is so cold outside. Although, once I did one for them, I had to have one while I sat with my back almost in the fireplace. 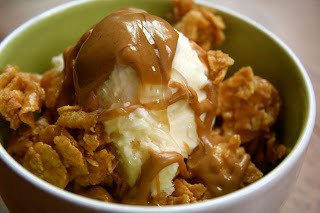 I love melted peanut butter on vanilla "ice cream" and the honey gets all thick and gooey...so good! Microwave the peanut butter and honey for 1 minute 30 seconds until it is melted and liquid. Add the cereal and stir to coat well. Place in an 8x8 square dish that has been sprayed with a little nonstick spray. 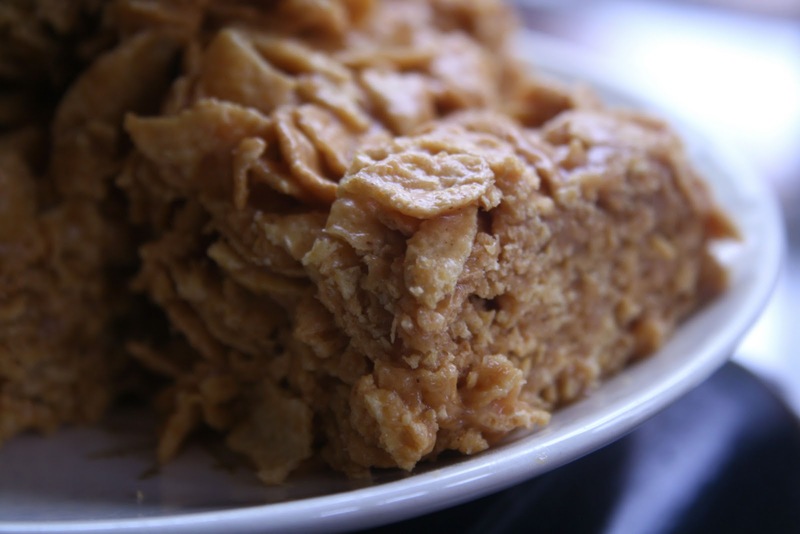 Using wax or parchment paper, firmly press the cereal in the pan so it all comes together tightly. Refrigerate until set. ***These set up in the fridge, but if you want a firmer bar, you should add 1 TBSP flax meal to the peanut butter mixture and bake them for 20 minutes at 350 degrees. Now, it's time to tackle Thursday! It is going to be crazy, but for now, the sun is shining so I feel a little more excited about tackling my to do list! Does the weather effect you? I need sunshine occasionally. It seems like it has been so gray lately. I hope you all have a great day! Sounds like a successful morning in the kitchen. I think I shock Jason by my kitchen messes sometimes too ;-) Those cereal bars sound like a great idea, fun snack. Hope you have a good one! W makes a huge mess when he cooks...i'm more of a clean as i go person! Those cereal bars look so good!!! Confession: I used to LOVE those special K cereal bars with the hydrolized milk binder...these look like a MUCH healthier option!! I love how easy these bars seem! They look great. I definitely need to get outside every day -- it is hard since it is gloomy here too, but the fresh (cold!) air feels good and when I do see the sun I like to spend a few minutes outside as well. It seems to energize me. This sounds great!! I think I'm going to make these today but do the firmer version! Three ingredients and that's it? Because these look even better than those three-ingredient cookies people sometimes make (and not to mention a little healthier? possibly?). Oh my gosh those look SO delicious! And simple! I love that it's just 3 ingredients. I'll have to remember to pick up some corn flakes next time I'm at the store! LOVE recipes with 3 ingredients!! And you are one productive lady in the morning - wow! Definitely a good day in the kitchen. Glad I am not the only one that likes ice cream and cereal (bars). Coconut ice cream with that would be great! These bars look wonderful :) I agree - PB + Honey is a great combo! The weather definitely affects my mood, too. It was sunny earlier and I just loved it. Sunshine makes everything seem a bit better! Wow, those PB bars sound so simple! I love that! Your boys are very lucky to have a mom like you! Oh dear! I spent many days of my childhood making "honey joys" with cornflakes, butter and honey or golden syrup. Now you've gone and added peanut butter (minus the butter) to an all time favourite memory?!?! How could I resist!????! YUM! I just made something similar with cereal, cashew butter, lavender honey, and cacao nibs. It makes for a great pick-me-up before the gym! The pasta looks great. I'd like to be the client who gets that! I eat ice cream in any weather. Do you think this could work w/ almond butter? They look so yummy for a quick morning breakfast! It's supposed to be in the 50s this weekend! And sunny, I think. Yay! 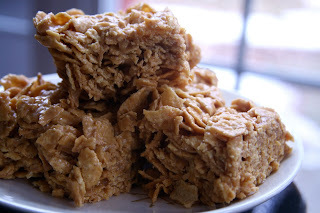 I'm loving these cereal bars! But then again, anything with peanut butter kind of steals my heart. oh those cereal bars look so good! your family is lucky to be eating them -yum! I'm totally making those cereal bars...but I'm slightly afraid that I'll eat them all at once! I want I want I want! The bigger the mess the more delicious the treat, right? Those bars sound absolutely delicious! unfortunately my boyfriend does not have a love for peanutbutter as I do. And then I'd have to eat them all myself...or is that a bad thing? Those look so yummy! I'm so eager to try them; my favorite combo of honey and peanut butter! These bars, are they chewy or rather crunchy? Tine, they are kind of both if that makes sense? They are chewy from the honey and peanut butter, but still kind of crispy from the cereal.